If you want to have a Drupal site built for you, your first and probably most important decision is choosing a contractor or shop to do the work. Who is most qualified for the job? Here are some insider tips designed to help you find a great, collaborative Drupal shop with the chops to build the site you’re dreaming of. Drupal is a powerful and flexible framework for content management. There are literally thousands of Drupal plugins that Drupal contributors have produced and shared. That’s great, but it means that matching your needs with the best available solutions requires a lot of know-how, which a shop or a developer doesn’t acquire overnight. So when choosing a shop, first look for experience. 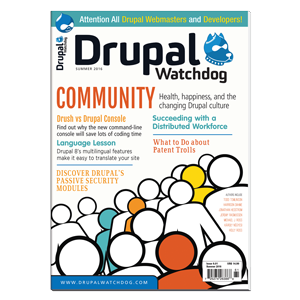 Drupal is collaboratively-built by thousands of contributors all over the world. Changes or additions to plugins come from community contributions, most of which arise from specific website projects: projects like yours. As a Drupal shop builds your site, they might well need to work with the users and maintainers of one or more plugins to get tips, fix problems, or suggest changes. So, after examining a shop’s experience, you’ll also want to look for collaboration and contributions. As well as contributing code, like modules or themes, there are many other ways that community members help build and improve the Drupal project. Members post issues and help test potential fixes; write documentation or contribute translations; help organize local events or meetups; provide training; and give workshops at conferences. All of these contributions illustrate the dedication, collaborative skills, and community profile that you should consider for the success of your site development. A key step in evaluating a service provider is an in-depth look at who works for them. Does their team have the experience and track record you’re searching for? To find out, your best resource is drupal.org, the Drupal project’s primary website. Start with the drupal.org Marketplace listings at http://drupal.org/drupal-services. You can filter the companies by sectors served, services provided, and country they’re based in. When you first bring up the listings, they’re filtered to show only “featured” shops — shops selected for their contributions to the Drupal project. On a given company’s listing, in the right sidebar, you get a list of its staff, with information drawn from each staff member’s drupal.org user profile, including: how long they’ve been on drupal.org, how many edits they’ve made to Drupal documentation, and what plugins they’ve contributed to. At a glance, you get a snapshot of the company’s expertise and contributions. You’ll also see a badge in the left sidebar if the company is a member of the Drupal Association. Even for companies that aren’t listed in the drupal.org Marketplace, drupal.org is a key source of information and insight. Can you find a list of staff on the company’s website? From there, use a search engine to find their profiles on drupal.org. A drupal.org user’s profile page brings together information about the individual and her or his contributions to Drupal. Besides reading what someone has to say about themselves, you can directly review their Drupal participation. At the top of the profile page, follow the “Posts” link to see a list of the pages that the user has posted or commented on. Read a few of the posts to get a feel for the tone of the user’s interactions. Is she or he experienced and knowledgeable? helpful? collaborative? At the bottom of each user profile, find a list of “Projects” (modules or themes), if present, with the number of commits (code-level improvements) made. A list of several projects indicates a relatively seasoned developer. The Certified to Rock site (http://certifiedtorock.com) offers a ranking for Drupal users based on their contributions to the Drupal project, passing publicly available information through a secret algorhythm to generate a score. The Drupal Groups site (http://groups.drupal.org) is where Drupal users and contributors from around the world meet, discuss, and organize. Look for a user profile where you can get a good idea of how involved they are. The drupalgive initiative encourages Drupal service providers to provide a special page on their websites to highlight the contributions they’ve made to the Drupal project. Look for a page at /drupalgive on a company’s website, for example http://www.chapterthree.com/drupalgive. Community involvement and contributions aren’t everything. After you’ve consulted the sources listed here and identified some strong candidates, you’ll still need to do the regular due diligence of interviewing shops or contractors, checking references, and negotiating a contract. But by using the available tools to understand community contributions, you’ll be able to identify the contractors and shops who not only use the tools, but shape and enhance and document them (and so know them inside out); those who collaborate, and both give and receive peer feedback; those who have the profile and connections to get things done. In short, a bit of time working the drupal.org resources can help ensure that your shortlist includes the people most qualified to get your Drupal site done, and done right.